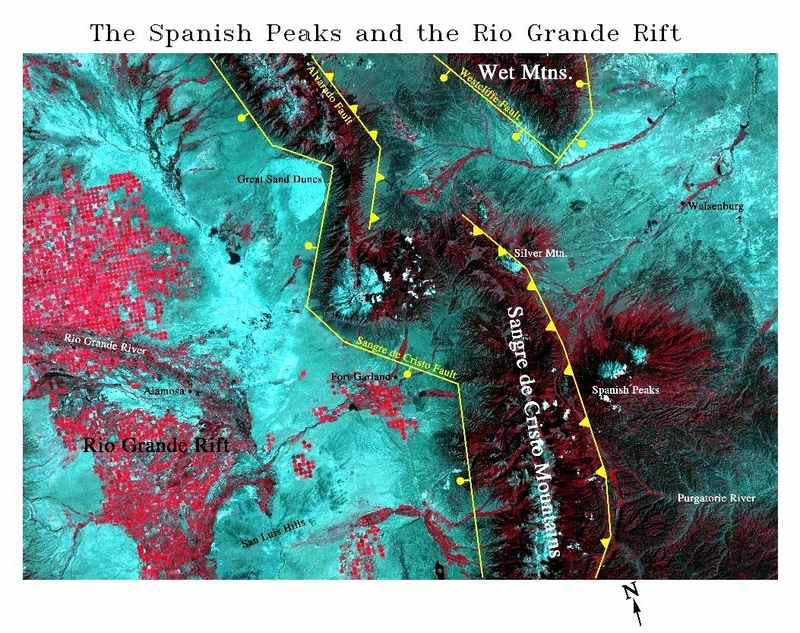 False-color (R:4, G:3, B:2) Thematic Mapper image (Date Acquired: 7/30/92; Scene Id: LT5033034009221210; Path: 33; Row: 34) of the eastern portion of the Rio Grande Rift in Southern Colorado. Vegetation associated with center pivor irrigation appears bright red. Conifers are darker red. Clouds are bright white with shadows on the northwest side. Structural interpretation based on work of Lindsey, D. A., Andriessen, P. A. M., and Wardlaw, B. R. (1986) Heating, cooling, and uplift during Tertiary time, northern Sangre de Cristo Range, Colorado, Geological Society of America Bulletin, v. 97, pp. 1133-1143.